Once upon a time I went to a show and it was called Shrek The Musical. It was about an ogre named Shrek (Michael Aaron Lindner) who lived in a swamp and he had to go rescue a princess named Fiona (Summer Naomi Smart). He had to do it because a man who wanted to be king, Lord Farquaad (Travis Taylor)asked him to go and get her. But on the journey back Shrek and Fiona fell in love. It is about no matter how you look you can still love somebody and once you get to know each other they will probably love you back. It is also about friendship and getting to know somebody. Even if you don't like them at first, like Shrek doesn't like the Donkey (James Earl Jones II), when you get to know them you can like them. 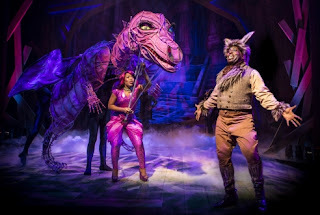 I really liked the Dragon (Alexis J. Rogers); I thought she was really good at singing. She could hold a note really long and I thought that she really made her song kind of touching even though she was a dragon singing it. She did that by the Dragon and the Donkey having a romantic relationship, and since they are such different creatures, them being in love I thought was just really sweet. I thought the puppet was really amazing. I thought it was nice that they didn't try to cover the actress up so it looked like the puppet was singing. They dressed her up like a dragon as well, so you could see that she was happy or she was sad, even though the puppet wasn't a kind of puppet that does all those kinds of expressions. I went with my friend Lana and my teacher Miss Rachel. My friend Lana and I were sitting next to each other and when the Dragon defeated Lord Farquaad, we high-fived each other and said "Girl Power!" There is a lot of girl power in the show. Like Fiona is not just like your regular damsel in distress. At the beginning it does kind of seem like that. But she's not. She's a sarcastic princess. She tears up books and she sings "I might have a little bit overreacted," or something along the lines of that. She actually tore up a bunch of books which is overreacting completely. She's not like "I'm going to just lay here and sing songs the whole day." She's an impatient princess; she's like annunciating a lot: "I. just. want. that. prince. to. come!!" She can belch in a very strange way. She doesn't just belch, she also farts. The song where she belches and burps and farts is called "I Think I Got You Beat." And I think that is the song where Shrek and the princess fall in love. I want you to decide who got who beat, and I'll give you my opinion. I think that the princess got him beat because it was Christmas Eve when she was sent away and Christmas is my favorite time of year so I thought that that was really cruel. But the point of the song is that they realize that they are basically equal. I really liked the song called "Make a Move." I liked it because the Donkey had a backup band and you would never actually have guessed that a Donkey would have backup singers. I just thought that was silly in a good way. This musical makes you think about things you never really thought about, and never really intended to either--like donkeys having backup singers, and ogres falling in love with princesses, and princesses that can do a burping chorus. The backup singers are the Three Blind Mice (Sarah Page, Rebecca Pink, and Alexis J. Rogers). I loved how it looked like they came up with microphones and they happened to be sticks that help blind people find their way around. I thought it was cool how the Donkey put on sunglasses and then everybody was staring at him. The Donkey was awesome because he was such a lovable character and he did a bunch of comical things. I loved it how, whenever he said something that was nice to Shrek, that he would take a step. "I like you Shrek." Step. "I think we could be friends, Shrek." Step. I also really liked how the Donkey was so amazed that Fiona called him a noble steed. I thought it was nice how Shrek and the Donkey became the best of friends even though they were completely different. Shrek was a stinky ogre who liked to be solitary and Donkey was funny and liked to make jokes. They just liked each other how they were. I thought that it would be nice if some of the smaller roles had more time on stage. 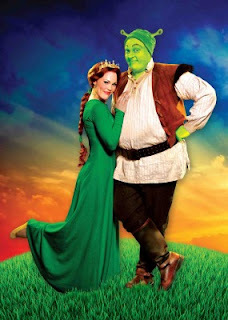 I really thought that the Ugly Duckling (Caroline Heffernan) was really good at singing and the character would have been good to be a friend of Shrek because they both weren't liked because of how they looked. I thought that Baby Bear (Matthew Uzarraga) was really adorable and was a great dancer. I thought if he would have had a dance solo that would have been amazing. The Big Bad Wolf (Norm Boucher) was really fun when he took off his granny robe and he was wearing a red sparkling outfit. I would have liked to see the Big Bad Wolf have a monologue about "Why do people hate me so much? I'm a really nice guy. Little Red Riding Hood is one of my best friends." I would like him to tell you why he likes to dress up like grannies and ladies and stuff. I like to dress up; I even like to pretend to be boys sometimes because I like to pretend to be what I'm not. You can pretend to be something that you are not and kind of feel like you are that thing. So that is why I think the Big Bad Wolf wants to dress up like a lady. People who would like this show are people who like ogres, burping princesses, and girl power. I think this show should be for ages 5 and up because younger kids might be kind of creeped out by Shrek when he roars. People should go see this show because it is funny, sweet, and it is fun for friends and family to go to together. Once upon a time I went to show and it was called The Australian Bee Gees Show. There were three people pretending to be the Bee Gees. The Bee Gees are a rock band from the 70s. They are three brothers who had been singing together since they were five so they decided to make a band. There names were Barry (Matt Baldoni), Robin (Paul Lines), and Maurice (Jack Leftley). Most of their famous songs were disco music. This show is very fun and after you go see it, even if you've never heard of the Bee Gees, they will become your favorite band. After the show, I asked my mom to download all their songs onto my iPod. The performers looked crazily like the actual people. They wore clothes that you'd think that they would wear, but they also had the same hairstyles and they did all the movements that they actually did in their concerts. I know this because I watched some of the Bee Gee's YouTube videos after the show, and I noticed that Robin held his hand up to his ear exactly like Paul Lines did in the show when I saw it. Also, Matt Baldoni bobbed his head when he was playing guitar like Barry did in the video. There was a song that I thought was cool that was called "More Than a Woman." And it was about a guy who was in love with a girl that was not just an ordinary girl. And he was singing about that to her because he had not noticed how much he liked her until now. I really like the falsetto part of it, and I also liked the piano in the back. I also loved their outfits when they were singing this song. They were sparkly and awesome. I thought it was very sweet how when they sang "Too Much Heaven" they all shared a microphone. It kind of showed how they had a very good brotherly relationship. They were goofing around while they were doing it; it made it really fun. Even when they were goofing around in the back, the people on stage weren't like "I am the awesomest up here." They were like "You did a great job!" to the other brothers. There's a song called "Stayin' Alive" that I am rocking out to even now. It makes you really want to dance and do the disco. It also makes you want to sing along. You can get up and dance whenever you want at the show! The performers want you to get up and dance. You want to help them because they ask you to help them in the song! When you watch the show, even if you don't want to really get up, you're just going to dance in some way: bob your head up and down or just bounce up and down in your seat. It is so fun to get to hear this song live when usually you just hear it in the grocery store. "You Should be Dancing" is a really fun song because it is so rocking. There is no way you can just watch; you just have to get up and dance. The lyrics are not complicated at all, so you can just sing along even if you haven't heard it. Sometimes I do like complicated lyrics, but sometimes I like to just be able to sing along. The lighting was also going crazy during this song, so I really felt like I needed to dance. I've seen some shows lately that showed the story of a rock star, but sometimes it could be a little pointless to have an actual plot and not just make it a bunch of songs. Like sometimes they have too many scenes that tell you the same thing, like sometimes they just say "We just want to play music the way we want to play it!" and they do that a bunch of times. I liked The Australian Bee Gees Show a lot because they didn't do any of the pointless stuff. They just did amazing music. It is a concert that kind of has a play aspect to it. It has a beginning, middle, and end. The beginning is them doing songs you might not know as much; the middle is them doing songs you know a little better; and the end is them doing all their famous songs, and then you rock out to them. Like you wouldn't put all the amazing stuff at the beginning of a play. You make the beginning to show that every thing is normal, and then something happens, and then they have the climax. People who would like this show are people who like rock music, amazing impersonations of the three brothers, and jumping up and down in your seat. People should go see this show because it is fun and gives you an experience like you would have if you travelled back in time and got to see the actual Bee Gees. Once upon a time I went to a dance show and it was called Tides. It was a bunch of different short dances all put together to make one big dance show. It is called Tides because it is about moons and water. I think this show is great because there are dancers in the show that really express the movement very well and that makes the show amazing and fun. And it also makes their emotions very clear. Some of them were sad dances, like "Drowning: Ophelia," and some of them were very happy dances, like "La Mer," and some of them were in between, like "King and Queen of the Moonlight." I really liked the dance called "King and Queen of the Moonlight" (choreographed by Sarah Heston). It was about a boy (Isaac Loomer) and a girl (Kelly Maryanski) who were in love. The thing is the girl was supposed to be kind of trouble, be he didn't care; he still loved her. It seemed like they were kind of connected for the dance. They were basically always for the entire thing holding hands, and it showed that they had a bond. 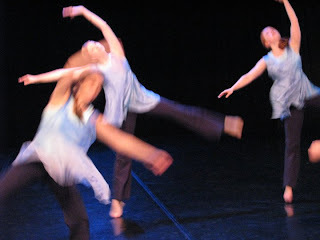 The dance for "Moonfall" (choreographed by Maren Robinson) was kind of emotional for me because it kind of seemed like one of the girls (LB Cohen) was very sick or very hurt and all that she wanted was to have some rest. Maren was carrying the sick person on her back for a long time and she just kept carrying her in different ways. At the end, Maren lays her head on the sick person stomach and it kind of seems like that she is sad that she is so hurt. My other idea is that they were such good friends that she didn't want to leave her alone. "Cry Me A River" (choreographed by Sarah Heston) was a really fun dance. Holliwood Monroe sang the song live while Suzanne Mena Czerwinski danced to the song. I thought the singing was amazing because it was so expressive. In the song, she was saying to her boyfriend that "You broke up with me, and now you say you are in love with me again, but you have to cry me a river for me to love you again because that's what I did for you." It was very nice how she sang while there was a live dancer dancing very gracefully but also kind of angrily. I really liked the dance called "Drowning: Dreams" (choreographed by Sarah Heston) because I thought it was very cool how they had masks on the back of their heads. There were three people dancing: Sarah Heston, Megan Heston, and Isaac Loomer. I really liked it how in the dance it was kind of like Sarah Heston was trying to get out of a nightmare basically, but she couldn't get out. They showed that she was trying to get out of the nightmare by the two other people making a cage out of their hands and her trying to get out. People who would like this show are people who like expressive dance, live music, and sitting by the water and looking up at the moon. People should go see this show because it is very beautiful and the dancers develop characters in their dances. It only has two days left, so go and see it now! 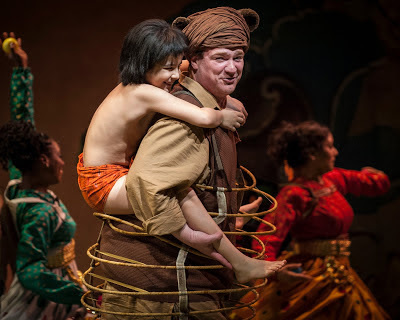 Once upon a time I went to a show and it was called The Jungle Book. It was about a boy named Mowgli (Akash Chopra) and how he grows up in the jungle in India. It was at the Goodman Theater, and it was directed by Mary Zimmerman. This is a great show for kids and adults because it has a lot of funny elements and it is based on a book and a movie that a lot of children know at least one of them. It was a very very cool adaptation because it was not just the book or just the movie; it was both of them combined and they also added some cool songs. I really liked it how in the set (designed by Daniel Ostling) they always had light (designed by T. J. Gerckens) shining on the red flower, which was not fire; it was actually just a red flower painted on the set. Just for people who don’t understand this when you go to the show, the red flower that Bagheera talks about is fire. But they use a bunch of flowers instead of actual fire when Shere Khan is dying. I met some adults that were very confused by that. I thought it was cool how a bed flew in and that was the treetops. But it might have been cool if they’d made it more like a tree. It took place, in the beginning, Mowgli opened the Jungle Book in his bedroom, so maybe Mowgli was trying to use his imagination in his bedroom and so he used his bed as the tree. All the costumes (designed by Mara Blumenfeld) were awesome because they were so elaborate. And some of them were kind of anthropomorphic. If you don’t know what anthropomorphic means, you can learn it from me: ADA GREY! Anthropomorphic means a non-human or inanimate object that is wearing human clothes or doing stuff a human could do. Bagheera (Usman Ally) was wearing a turban, but he was still a panther. Baloo (Kevin Carolan) was kind of wearing a Slinky skirt, but he was still a bear. My favorite costumes were Baloo’s, the monkeys’, and Shere Khan’s (Larry Yando). The monkeys had beards that were super cute, and the tamarin monkeys are my favorite kind of monkeys. Shere Khan had ears and tail on his costume and it made him look kind of imaginary but also very elegant. I thought they did a great job putting in dance. Some of it was Indian dancing and some of it was jazz; they mixed it together. I thought that when they dance they also added some funny things because one time in the King Louie (André De Shields) dance, “I Want to Be like You,” they threw an entire tea set all over. Nothing broke because I think it was rubber or plastic. I thought it was nice how Shere Khan and the Deer (Alka Nayyar) did a dance together called “Your Unexpected Friend” / “Your Unexpected END,” and at the end of the show the Deer guided him to reincarnation. I thought it was really cool at curtain call how Bagheera did rap dancing. I thought it was cool because he kind of wasn’t in character but it was fun to see Bagheera dancing when you would expect him not to do any kind of dancing at all. I thought it was funny when Baloo was singing a blues song about missing Mowgli, but it was also kind of a sad song. You kind of felt sorry because he actually did miss Mowgli. Blues songs are usually about missing like your girlfriend or your boyfriend. But this is about missing a kid. NOT that Baloo the character thinks that Mowgli is his boyfriend! He was also eating honey while he was singing the song which made it rather like he was chewing, but also later he put his face into the honey pot and he was singing while his face was in it. I thought it was funny how he was singing into the pot. He sounded very echo-y. Mowgli wants to be like Baloo so much that he kind of takes the role of a fatherly figure to Mowgli. He is like a fun father and he teaches him how to be a bear. I really liked Kaa (Thomas Derrah) the snake because he had so many different ways of being a snake. He was a puppet, but he was also just a bunch of other people holding balls, and then he was also different parts of him coming out of little different trap doors. I loved his song; it was called "Trust in Me," and he was hypnotizing Mowgli. I loved it when Bagheera held up the googles when Kaa hypnotized him. I really liked King Louie's number where he sang this song called "I Wanna Be Like You." So they have taken Mowgli captive because they think he has the red flower, but he doesn't. I thought that King Louie was a very good singer because he could hold a note for a long time and sing very good falsetto. And the dancing was also amazing and the monkeys were running around everywhere, taking all of his bananas which King Louie gave Mowgli. I thought that this scene was really fun because everyone seemed like they were having a good time and it was also very funny. Bagheera is like a strict father who is like, "this is what you have to do next, then this." Mowgli needs two kinds of fathers, really. A strict one and a fun one. The fun one is Baloo. It is just not possible for him to have a fun-loving and a strict father. It is possible to have a fun-loving and strict father, but Mowgli does not have that option. I think that it is good to have a fun-loving and strict father because sometimes you really need your kid to do something and sometimes you just want to have fun. Bagheera sometimes takes walks with Mowgli and that shows us that he is a very nice guy but he just wants the best for Mowgli. I thought it was really funny when they were walking and then they--instead of water for the show they had cut-up paper--stopped for water and Bagheera said "Have some water, Mowgli." And Mowgli drank it out of his hands, but he was more like burying his face in it, which was really funny. I loved how Mowgli was funny but he also made me understand what it felt like to be in Mowgli's situation. The Little Girl (Glory Curda) was also great; she was very good at singing, I thought. People who would like this show are people who like elaborate anthropomorphic animals, fatherly figures, and bears singing the blues into honey. 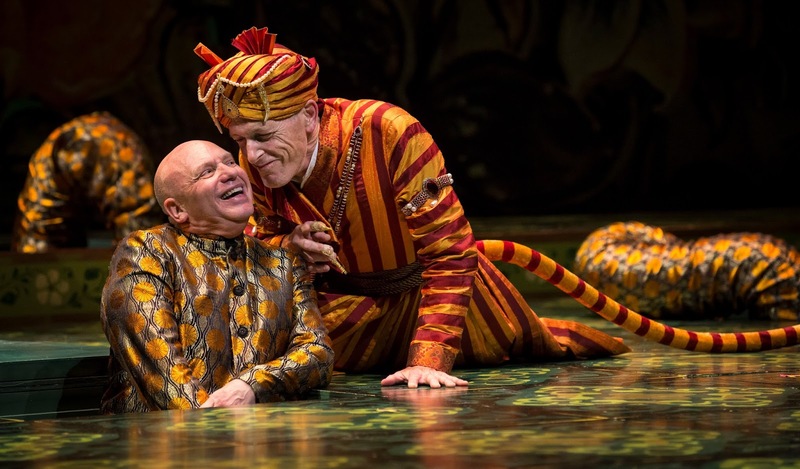 I think people should go see this show because it is funny, all the characters are likable (even Shere Khan who is the bad guy), and it has a lot of people's favorite parts from the movie. I think this show is for ages 3 and up.